At one of the nations most prestigious universities, Doug Cook has left the rat race of his law practice behind to study to be a college professor. Doug is writing his doctoral dissertation under the professor who first inspired him to dedicate his life to the world of ideas, and he has a great group of friends and a wonderful girlfriend. However, when a female student is found murdered on a classroom floor in the middle of the night, Dougs life is thrown into turmoil as he is forced to risk everything in order to defend the person who is accused of the terrible crime: a popular assistant professor who happens to be married to Dougs beloved sister. And the more Doug tries to help his brother-in-law, the more he comes to realize that the ivory tower of academe is only a myth. In his book, Scott Gerber draws on both his own familiarity with the field of academic law and his experience as the son of a college professor. The Ivory Tower examines the conflict between the image of higher education as a serene oasis of teaching and research and the reality of power and politics that lies just beneath its composed exterior. 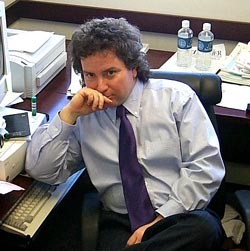 Scott Douglas Gerber is a Law Professor at Ohio Northern University. He received both a Ph.D. and a J.D. from the University of Virginia, and a B.A. from the College of William and Mary. He is also the author of two works of nonfiction, First Principles: The Jurisprudence of Clarence Thomas (1999) and To Secure These Rights: The Declaration of Independence and Constitutional Interpretation (1995), and editor of Seriatim: The Supreme Court Before John Marshall (1998). The Ivory Tower is his first novel.